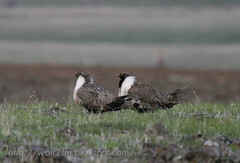 On Saturday Karyn and I decided to attend the local Audubon Society field trip to view a Greater Sage Grouse Lek. We are members of the Audubon Society, but you don't have to be to attend their field trips. I had previously seen a Greater Sage Grouse female (just a few weeks ago), but never a male and not in a Lek where they are in full display. There is a petition in process to list the Greater Sage Grouse as Endangered. More information can be gathered at The Sagebrush Sea. Unfortunately, political pressures are impeding the process. We arrived at the park and ride lot at an early 5am to carpool to the Lek site near Midvale Idaho. The field trip was lead by a biologist which specialized in the Greater Sage Grouse. He provided an overview of what we would see and the procedures to minmize the disturbance of the Lek. He also told us the Lek was currently in a feedlot! We got up at 4 in the morning to go look at a feedlot. Luckily his definition was different than our. It was an old pasture, not heap of cow dung will cows laying around. Two others joined us in our car for the carpool to the Lek site. Arriving at first light, we could see a number of males displaying about 30 yards from the road. We parked and watched for a while from the car before getting out so as not to disturb them. 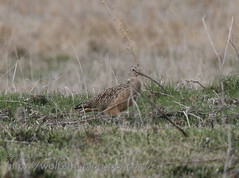 There were 6 males on the near hump in the pasture, with a couple of other in the far distance. We watched as the males would charge each other in full display. They sure are strange birds! We watched for nearly an hour before they moved off beyond the hump and out of view. Unfortunately, there was still not enough light for a great photo. This is the best that I got. 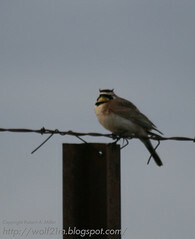 Across the road from the Lek site, This Horned Lark joined in the viewing. The rest of the field trip involved a loop on the country roads around the Midvale area, then a planned walk on the Weiser River Trail. The field trip guides were experienced in the area stopping to look at birds in along the way. At each stop we saw unique birds that I would have easily missed had I taken the trip myself. Passing one pond we saw a Greater Yellow-legs, which was a new bird for me. The lead car, with the guides, missed it. At the next stop we walked back to show one of the guides, who did see it just as it flew off. Just then a Wilson's Snipe started flying overhead. Here is a shot. 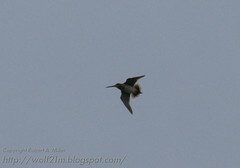 The Snipe's loud vibration of its tail feathers echoed all around us. A fascinating bird to listen to. We would see a couple of Wilson's Snipes later in day in their courtship displays. The Long Billed Curlews were also out in force. We must have seen a few dozen of them through the day. 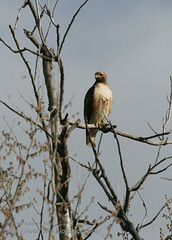 Probably my best photo of the day was this Redtailed Hawk. There was a pair of them near a large nest which had to be theirs. They watched us with interest as we passed by their home. We also came around a corner to see a large Bald Eagle sitting on the top of a hill in the grass. It seemed like a very odd place to find one. It didn't look like to had food there, but seemed intent just to hang out. The last stop of the day was a walk along the Weiser River Trail. 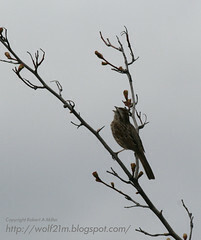 This was a great place to see Song Sparrows (pictured), Great Blue Herons, Ducks, Geese and Spotted Towhees. 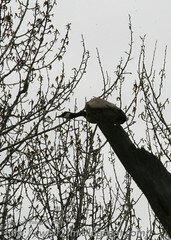 The most unique sight of the day, other than the displays of the Sage Grouse, had to be this Canada Goose trying to nest on top of an old snag. Not sure how well that is going to work out! In all it was a very worthwhile and educational trip. The guides were very knowledgable and willing to answer any questions. They pointed out a number of birds that I would clearly have missed. If interested you should attend a field trip. You don't have to be a member to participate, although the cost of membership is low and supports a good cause. Bird list for the day (38 Species): Snow Goose, Canada Goose, Wood Duck, Mallard, Blue-winged Teal (New bird for me), Green-winged Teal, Ring-necked Duck, Bufflehead, Common Merganser, Greater Sage-Grouse, California Quail, Great Blue Heron, Bald Eagle, Northern Harrier, Red-tailed Hawk, American Kestrel, American Coot, Killdeer, Greater Yellowlegs (New bird for me), Long-billed Curlew, Wilson's Snipe, Ring-billed Gull, Rock Pigeon, Mourning Dove, Northern Flicker, Say's Phoebe (New bird for me), Black-billed Magpie, American Crow, Horned Lark, Tree Swallow, American Robin, European Starling, Spotted Towhee, Song Sparrow, Dark-eyed Junco, Red-winged Blackbird, Western Meadowlark, American Goldfinch. Great trip, Rob. Those are some spectacular birds on your day list.